I recently returned from a vacation in Spain. 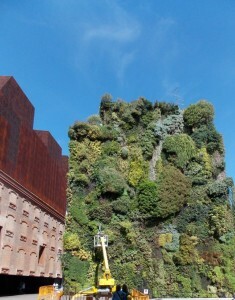 During the three days that I spent sightseeing in Madrid I happened on to a monster of a living wall that I had to share about. It’s size and beauty juxtaposed against a rust colored building and the bright blue sky was breathtaking. Look at the photo below: you can get a sense of its breadth by looking at the tourists as well as the equipment servicing it that day. It is located in an area that is called Madrid’s Golden Triangle, a cultural district of the city that is renowned for its spectacular art museums and historical buildings, fountains and statues. This marvel of architecture and horticulture was designed by French horticulturalist, Patrick Blanc. 15,000 plants make up a pattern of colors and textures that beg to be touched. This wall is one of many designed by Blanc, best known for his work in Paris. My research has found that his designs are inspired by the moss and ferns that commonly grow on cliffs and rocks in forests. Although he moss and vines are standard in all his designs he also incorporates plants based on the environmental conditions of each wall. Each of his vertical gardens is constructed with PVC plates and a metal frame covered with a Polyamide felt, which acts as a support for the root system. Seeds and cuttings are then attached to the felt with a density of approximately 10 plants per square foot. Rather than growing in horizontal rows in soil, the plants grow vertically along the felt material. The irrigation is an automatic drip system that starts at the top of the wall. As water trickles down the wall, it is absorbed by the felt and root system. Patrick Blanc is considered a modern innovator of the green wall responsible for popularizing it. My online investigation points to a Professor Stanley Hart White, of the University of Illinois who actually invented it in 1938. In fact he patented the first known Vertical Garden as a treatise on modern garden design.